Shijian-10 is a recoverable satellite operated by China to conduct a number of experiments and expose a variety of specimens to the space environment for a period of weeks before returning to Earth for laboratory analysis. 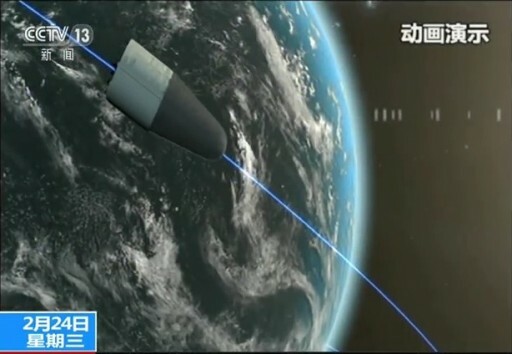 The satellite is based on a military design, using the FSW (Fanhui Shei Weixing, Recoverable Satellite) re-entry vehicle as a basis to provide a scientific platform. The Shijian-10 satellite follows up on a similar flight completed in 2006 involving the Shijian-8 spacecraft that launched on September 9, 2006 and carried over 2,000 seeds divided in 180 groups as well as other experiments looking at plant and animal physiology in the space environment. SJ-8 landed on September 24 after 15 days in orbit to mark the start of extensive testing of the returned samples. The total payload mass was around 215 Kilograms and included seeds of different crops, food plants and fungus spores. 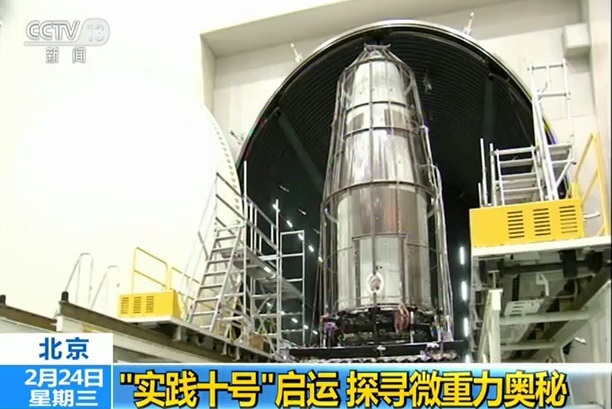 According to officials, the Shijian (=Practice) satellite series serves different purposes including scientific experiments, technology demonstrations and other undisclosed purposes. Shijian satellites have been manufactured by different contractors and the vehicles were injected into different orbits. The program started in 1971 with the launch of Shijian-1 atop a Long March 1 rocket. It was only the second satellite ever launched by China, carrying basic science equipment including a space-based Geiger-Müller counter for the study of the radiation environment in near-Earth space, orbiting Earth in an elliptical orbit. 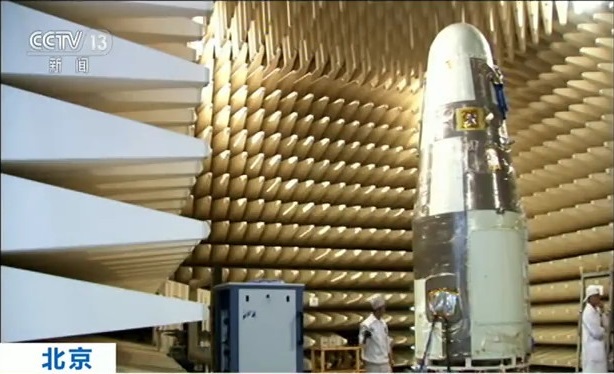 The Shijian-10 project was initiated in 2008 but had a rather long road to the launch pad. SJ-10 was terminated early in its development phase before being re-started in 2011 to enter its engineering development phase. A number of delays pushed the launch from 2015 into April 2016. 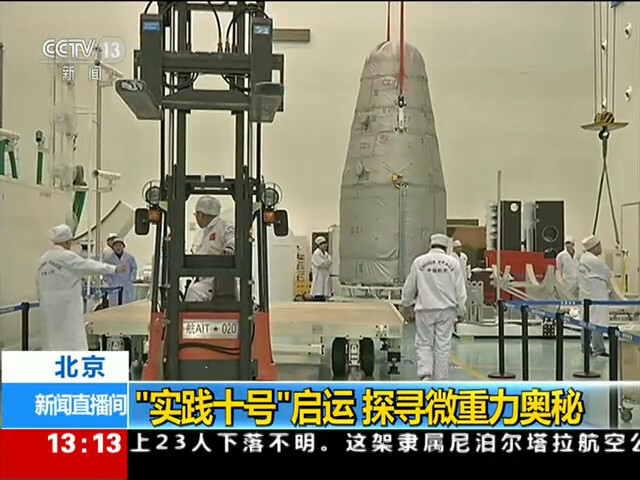 Shijian-10 is an improved version of the SJ-8 design weighing 3,600 Kilograms and purely relying on batteries to power its onboard systems for the 15-day planned mission. 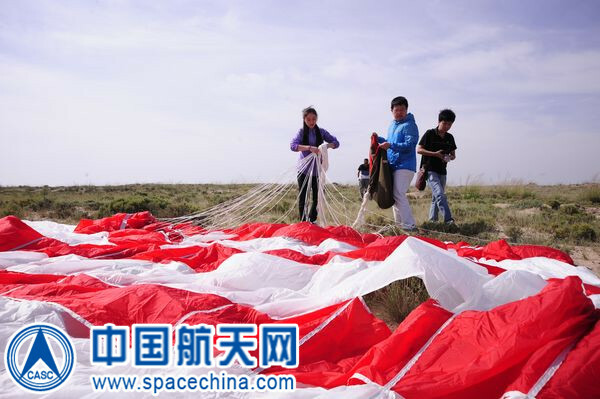 Launching atop a Long March 2D rocket out of Jiuquan, SJ-10 aims for an operational orbit of 220 by 482 Kilometers at an inclination of 63 degrees. Development of recoverable satellite technology was started by China in the late 1960s and the first FSW satellite was launched in 1974 but did not reach orbit. The FSW satellites went through a number of generations, featuring improvements to spacecraft and payload systems. The official purpose of the FSW Earth-Imaging Film-Return Satellites was agricultural monitoring, however, some of the missions were dedicated to military reconnaissance. The first use of the FSW platform for a flight of scientific experiment payloads occurred in 1987, hosting biological experiments. During the flight, a microgravity level of around 10^-5G was reached, enabling even very sensitive experiment with strict µG requirements to be hosted by this type of mission. 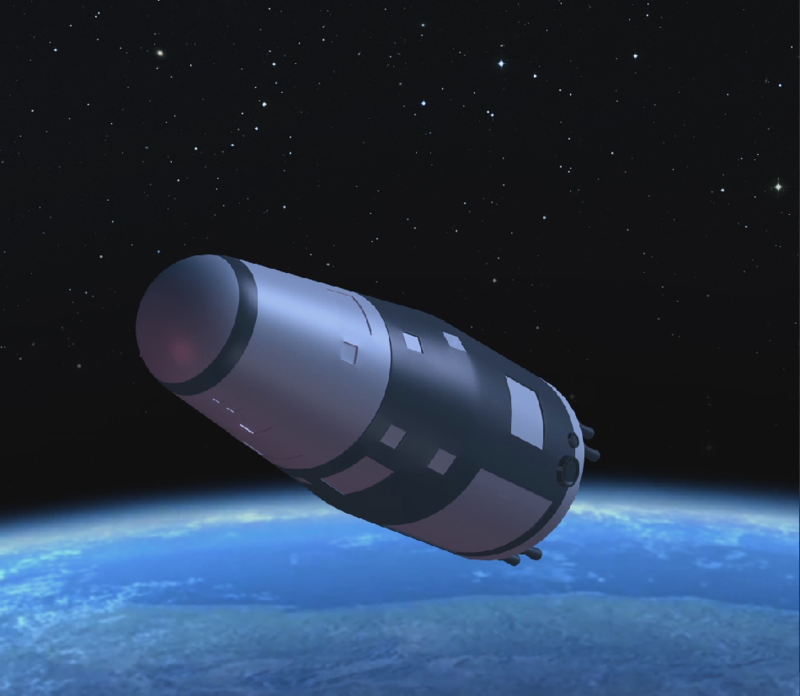 The FSW satellites used a solid-fueled retrorocket for their deorbit burn and an ablative heat shield made of impregnated oak to withstand re-entry. Typical forces at re-entry were up to 20Gs but it is understood that the newer satellite variations employ lifting technology to reduce re-entry loads and increase landing accuracy. 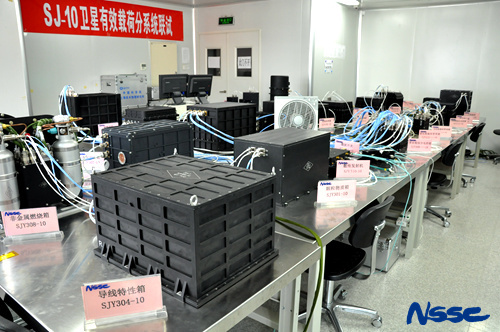 Shijian-10 can accommodate a payload of up to 600 Kilograms and carries 20 experiments covering a range of areas including microgravity fluid physics, materials science, space radiation, biology and biotechnology. The Chinese experiments are managed by the Chinese Academy of Sciences (CAS) in cooperation with six Chinese Universities. International payloads flying on this mission were developed by the European Space Agency and the Japan Aerospace Exploration Agency. Selected from over 200 proposals, the science payloads aboard the SJ-10 satellite include six fluid physics experiments, four combustion studies, eight material science investigations, three radiation experiments, three gravitational biology studies and four biotechnology payloads. EFILE studies the thermocapillary effects at the liquid-gas phase change interface in an evaporation process. Liquid drops will be injected into a heater and evaporation will be studied in two different experiment runs – one involving a free drop, the other using the sessile drop technique and keeping the drop at a constant volume through a feedback control system to maintain the drop size and shape. Knowledge on hydrodynamics, evaporation processes and the mechanisms driving mass transfer in evaporation in the microgravity environment can be of tremendous use in the development of environmental control systems for future crewed spacecraft. This experiment studies the physics behind granular transportation in microgravity. On Earth, grains can be transported through vibration and the question is whether similar transport mechanisms are possible in the space environment. Nucleate boiling is a widely used method for high-heat flux transfer on Earth and in space, however, very little experimental data is available on the boiling process, especially the local convection and heat transfer rate on bubbles as they grow and eventually depart from the heating surface. To better understand heat transfer mechanisms in boiling and to verify analytical and numerical models, experimental data is needed. The SOBER-SJ10 study aims to study local convection and heat transfer on an isolated local vapor bubble during nucleate boiling on a simple flat plate heater outfitted with a number of sensors to measure the temperatures underneath the bubble. In microgravity, a study of thermocapillary convection is easily possible while on Earth, these processes are covered by buoyant convection. A liquid medium will be studied as part of this experiment to measure thermocapillary flow patterns and transition pathways. The experiment facility includes the necessary liquid support systems for filling the system and a temperature control system. Sensors include thermal sensors, infrared imagers, and a displacement sensor. Knowledge on flow patterns, oscillations, and transition issues of thermocapillary convection is useful for crystal growth and materials experiments in space. This experiment uses a Colloidal Material Box to look at self-assembly processes in colloidal media to uncover mechanisms behind the creation of colloidal crystals which is not possible in a gravity environment due to buoyancy convection. The experiment assembly includes injection management systems to control the colloidal and liquid crystal media and mixing tasks, an optical observation unit with lighting and imaging equipment to document the liquid crystal phase transition and evaporation of colloidal droplets, a sample management system, and an electronic control module to deliver power and handle experiment data. Self-assembly dynamics in colloids under microgravity will be studied by the experiment to generate large single colloidal crystals. The experiment also looks at phase transition models and attempts of verify the mechanisms of entropy driven phase formation for the first time. This experiment tries to investigate the pre-ignition characteristics of wire insulation in microgravity. It also looks at soot emission during the ignition stage and smoke distribution during the wire insulation combustion process. In-space fire safety is a crucial part of spacecraft design, however, there are no firm models based on experimental data on combustion in space. Given the difference in heat transfer in a gravity environment and in space, heat accumulation in the vicinity of electrical wires and components is a frequent problem and a possible source of fires. This is the first dedicated study on the properties of cable fires in space. The study aims to examine the fire characteristics of wire insulation and to deliver data and guidelines useful in the development of fire detection systems. Parameters measured by the experiment include ignition delay time, ignition temperature, ignition radiation energy, soot emission during pre-ignition and ignition, and smoke release and propagation during the burning process. These two investigations aim to uncover fundamental processes and mechanisms in combustion of solid materials as single particles or pulverized clouds of typical coals found in China. Studying these processes in an ideal buoyancy environment will deliver valuable data for the validation of models for coal ignition and combustion. The experiment facility includes optical sensors to record the combustion process and flame spread, gas analyzers to measure combustion gases and sensors for temperature. 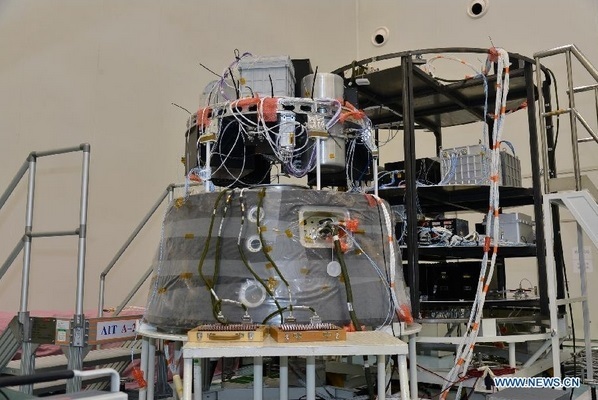 This will deliver a data set for a detailed comparison of burning mechanisms on Earth and in microgravity leading to a better understanding of the buoyancy effect in coal combustion on the ground, also looking at developments in emission control. The study of burning processes in space is of great interest as no models exist for ignition and flame spread along a sizeable scale. Studies of fires in microgravity and derived models of flame propagation is of value in the development of future spaceflight fire safety systems. This experiment looks at the ignition and burning characteristics of thermally thick solids that have not been studied in previous experiments. The experiment will make use of varying low velocity flow and varying oxygen concentration. Also, different fuel types and geometries will be looked at. The goal of the experiment is finding a limiting oxygen concentration or flow velocity where the flame will propagate in space to allow for a comparison with Earth-based combustion. Furthermore, the study evaluates the effect of flow velocity, oxygen supply and material shape on flame growth and spread in order to improve models of solid material combustion in space. The experiment contains eight fuel samples, each with its own igniter wire, comprised of two different fuel types: flat samples and rods. The samples consist of Polymethylmethacrylate (PMMA) and Polyethylene (PE), typical materials found in many applications on Earth and on spacecraft. Typically, samples are ignited in the center and opposed-flow or a combination for opposed and concurrent flow will be applied. Other samples are ignited on one end to yield concurrent flame spread rates and possible self-extinction. Solidification of metals and crystal growth experiments in space have become a major part of materials science since the absence of gravity-dependent phenomena allows a detailed look at fundamental processes in metallurgy and crystal growth normally obscured in the gravity environment on Earth. Heating and melting samples of metal alloys or other materials in a zero-G environment followed by the solidification of the sample yields a very pure material without any contaminations. The study of the solidification process and the finished product can provide valuable knowledge concerning the properties of the material that could improve production techniques on Earth for better material properties in alloys, glass and ceramics. The study performed on SJ-10 aims to synthesize large semiconductor crystals with uniform composition and virtually no defects, and high quality metal alloys that can not be obtained in gravity. This will increase the current understanding of gravity-driven phenomena affecting material properties and help develop new crystal preparation processes to yield higher-quality and larger crystals. Synthesis and characterization of high-performance thermoelectric semiconductors with favorable thermal/electrical properties to permit a study of their microstructure. Growth and properties of Indium Arsenide Antimonide, a promising material for use in photovoltaic systems as well as infrared detector elements. The experiment aims to obtain large single crystals with homogenous composition to allow an assessment of the optical properties and the composition of the material. Space growth, numerical simulation and characterization of Indium Gallium Antimonide at high quality and uniformity. This material is of great interest because of an adjustable bandgap by varying the Ga concentrations, making InGaSb suitable for various industrial applications. Space solidification and defect control of single crystals of Al-Zn-Cu-Mg alloy, a useful model system for an examination of the effects gravity has on the solidification process and microstructure to single superalloy crystals. Synthesis of metal matrix composites by self-propagating reaction under microgravity examines Self-propagating High-temperature Synthesis (SHS) as a preparation method in the space environment by analyzing the underlying mechanisms to develop models describing the structure of particle-reinforced metal-matrix composite materials. Preparation and wettability properties of Al2O3/Ti-based alloys in space – an assessment of interface structure, AL2O3 particle site and distribution as a primary driver of material properties. This will yield valuable data for the terrestrial production of its material. SCCO is a collaboration of the European Space Agency and China to study the Soret Coefficient of crude oil which has implications for the understanding of Earth’s oil reservoirs buried Kilometers underground. The experiment facility consists of six cylinders, each containing a milliliter of crude oil, pressurized to 400 atmospheres which is typically found in undergoing reservoirs. The experiment is conducted to look at a diffusion effect caused by pressure and temperature gradients varying with depth, leading to a separation of different petroleum compounds causing heavier and lighter deposits to rise and sink over geological time scales. The goal of SCCO is to quantify this effect using data gathered in the space environment. The crude oil is contained inside small titanium cylinders with steel internal valve mechanisms to keep the oil in a hypercritical state. As part of the experiment, one end of the cylinder is heated while the other is cooled, causing the separation of petroleum components. At the end of the mission, a divider is inserted to prevent the migrated liquid components from mixing again. SCCO has a mass of 8.5 Kilograms. Knowledge gained from this experiment is hoped to help in the prediction of the distribution within oil reservoirs where many mechanisms such as diffusion, thermodiffusion and convection in porous media contribute to the separation of the petroleum media. 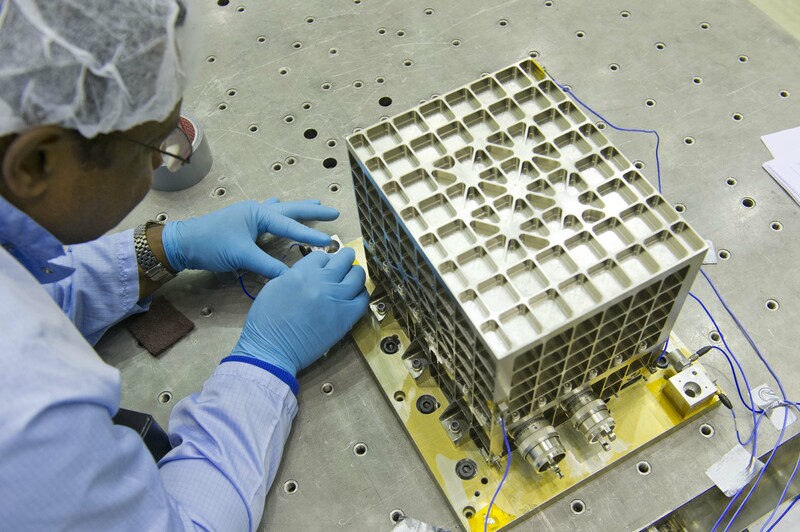 Plant model samples are located in three different radiation environments inside the satellite and Tissue Equivalent Detectors will be used to measure the absorbed dose, dose rate, linear energy transfer value and dose equivalent. Samples are retrieved after landing and put through genome epigenetic scanning and proteomic approaches to extract information on biological changes undergone by the organisms as a function of radiation dose. Radiation-sensitive mutant mammalian cells and fruit flies are exposed to the space radiation environment to examine the quantitative effects of radiation on the stability of the species’ genomes. 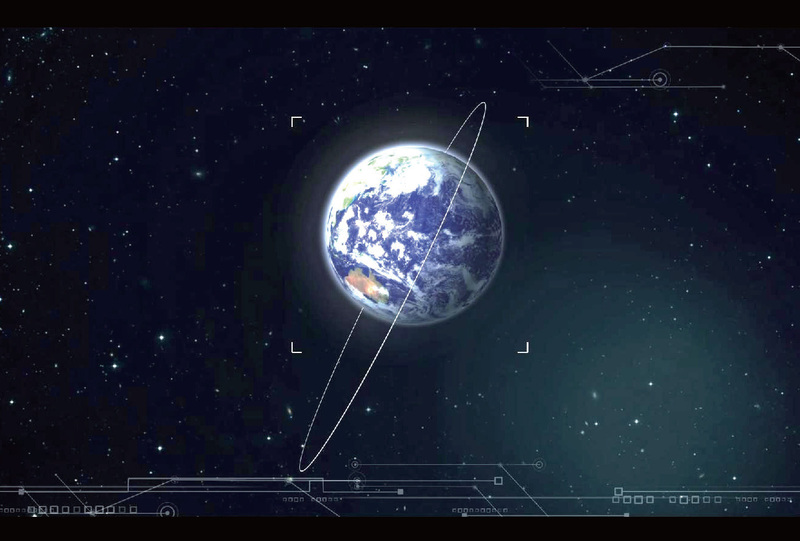 The aim is to identify sensitive biological molecules that could be used as radiation markers in future studies requiring sensitive detection methods for biological effects of space radiation. Simulated microgravity studies run in the past showed that microgravity could slow the repair of DNA double strand breaks and further experimentation highlighted the difference in response to radiation seen in different cells. Mouse cells and fruit flies will be flown as part of this experiment to look at genomic stability. Wild-type and radiation-sensitive mouse cells that are known to respond very differently to radiation will be exposed and analysis will be made at different time points in the space flight to gather quantitative parameters of space radiation genomic effects. Also, the study looks at gene expression profiles in the different mouse cells to identify sensitive biological cells for future studies. The silkworm is an important insect for industry and therefore great interest exists in developing new silkworm strains for different purposes. Because of the duration of the silkworm’s developmental stages it is suitable for a flight on SJ-10. Exposing silkworm embryos to the space radiation environment, the study aims to look at gene expression patterns of embryos, protein structure, potential mutations and their functions, and changes in embryo development as compared to a gravity environment. Multiple samplings will be conducted throughout the whole embryo development stage. Plants are exposed to the microgravity environment to evaluate hypotheses concerning how plants sense gravity. One of these hypotheses focuses on statoliths, starch grains in plant tissues than can sense the direction of gravity by converting the displacement of the grains to chemical signals which trigger cascades and signals to reaction sites of the gravitropic response (plant grow direction). This experiment will look at the behavior of statoliths in the space environment and study changes in transduction cascades. Furthermore, the experiment looks at the structure of the cell walls in the plant to find out whether lignin metabolism is changed in microgravity, influencing the stability of the plant cells. A number of processes involving mammalian cells in microgravity remain fully unknown such as the question if and how mammal cells can sense microgravity. It is not clear whether individual cells can sense a change in gravitational conditions and whether the cellular sensation is direct or indirect. Study is also needed to uncover mechanisms of inter-cell communications in gravitational changes. 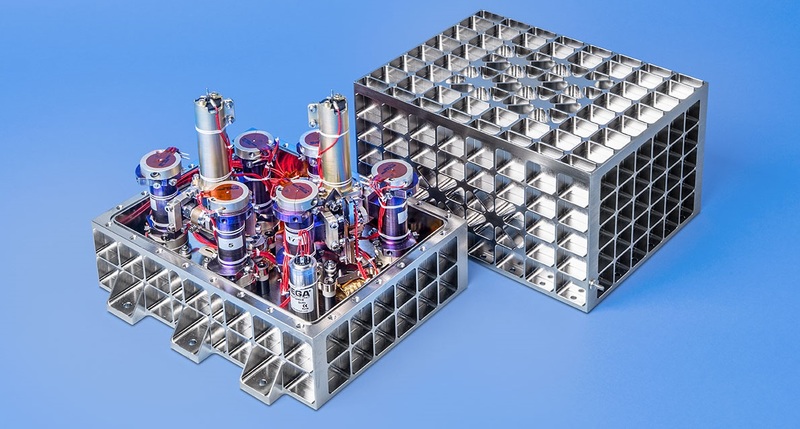 This experiment flies to space a cell culture support system comprised of a precisely controlled flow chamber and gas exchange system to support the cells and investigate mass transport mechanisms in cell growth and cell-to-cell interactions. The primary goal is to distinguish direct responses of cells from indirect responses by looking at the varied mass transport properties. 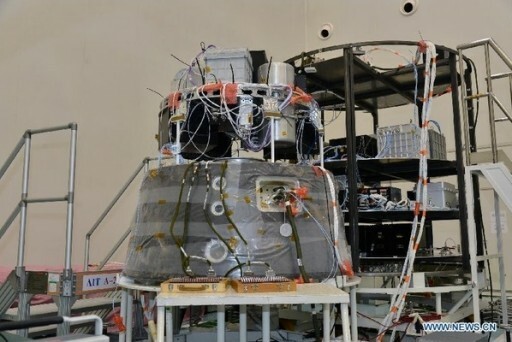 The Shijian-8 mission has shown that plant flowering was delayed in microgravity, but no information on possible mechanisms on a molecular level was obtained. Therefore, this study has been designed to track the mechanisms behind the light-induced flowering signal traveling from the leaf to the shoot apex. Knowledge of these mechanisms is of importance for further understanding the role of gravity in plant growth and the design of future in-space plant growth systems to provide crew food on extended missions. The study uses Arabidopsis thaliana and rice as two contrasting plant types, one is a long-day plant, the other a short-day plant. For both, the photoperiodic control of flowering in microgravity is to be assessed through the monitoring of tracer genes and floral initiation in the shoot apex, making use of imaging and living fluorescence imaging. Stem cells are undifferentiated cells with the ability to differentiate into cells of specific tissues to fulfill specific purposes. This ability makes them a key element of regenerative medicine and stem cells can also produce new stem cells in a self-renewal process which is the focus of this experiment. Stem cell growth and differentiation will be assessed in a three-dimensional cell culture by means of in-flight microscopic imaging and gene/molecular analysis of the returned samples. No such study has been conducted to date and this experiment is hoped to deliver new information on the characteristics of hematopoietic and neural stem cells for use in medical developments. The effects of the space environment on mammalian reproductive systems is relatively poorly understood given the controversial nature of this area of study. As part of the SJ-10 mission, the early development of mouse embryos will be studied using microscopic imaging and the return of chemically fixed samples to the ground. Embryonal development in mice is relatively well understood and includes a number of well defined morphogenic changes in the first four days prior to implementation in the uterus. The experiment hopes to determine whether early mammalian embryo development is possible in the space environment and, if possible, to observe the development process. This study is considered relevant for future space missions, the colonization of the Moon and exploration of other distant targets, which will all require animals and humans to function and reproduce. This experiment looks at the osteogenic differentiation of mesenchymal stem cells in the space environment based on alkaline phosphatase ratio and cell signaling pathways to understand the molecular mechanisms of human bone mesenchymal stem cells in space. 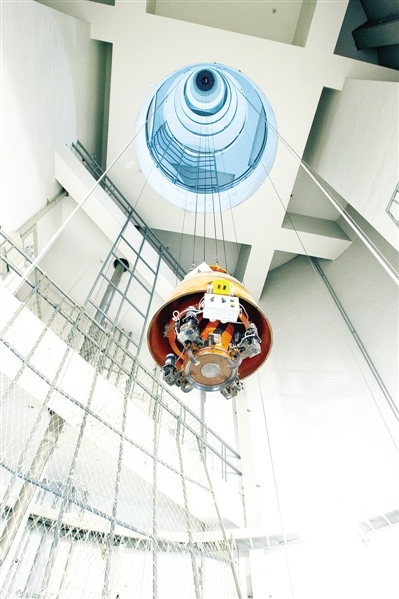 The primary objective of the experiment flying on SJ-10 is to demonstrate an experiment facility capable of supporting the cell culture, inducing osteogenic differentiation, completing the fixing and lysing of induced cells and preserving the samples in low temperatures until the satellite returns to Earth. Copyright © 2019 Shijian-10. All rights reserved.